Looking to increase your headcount this year? You’re not alone – 36% of companies in Singapore are also planning to increase headcount in 2017. Of these, six in 10 are looking to hire at middle-management level. According to Michael Page 2017 Asia Salary & Employment Outlook survey, of the nearly 450 employers in Singapore who took part in the survey, 63% of companies who responded expect to offer employees a 1% to 5% salary increase. 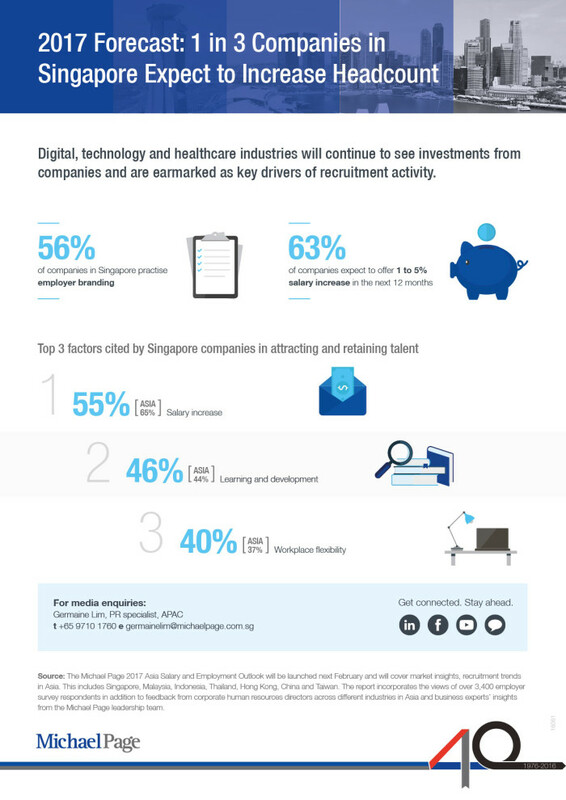 With markets such as healthcare, technology and e-commerce expected to grow significantly in Singapore, human resources professionals will be sought after by these firms to support their growth. However, with a sluggish overall economy, many companies are streamlining costs and HR professionals will increasingly be expected to multitask and demonstrate measurable, commercial value. In Singapore, as organisations realise the value of aligning HR processes and policies with business goals, HR business partnering is also gaining popularity. In the HR function, candidates in demand are those with expertise in change management and organisational transformation, and performance management and succession planning. At the same time, there is also a move towards specialist talent acquisition roles, rather than recruitment being one of several responsibilities given to generalists. In general, candidates moving between jobs may expect salary increases of about 8 to 12%. Candidates in the engineering and manufacturing function looking to switch jobs in 2017 are likely to command increments of 10% to 15%. However, over the next year, the recruitment process might become more lengthy as employers have revealed the intent to be more cautious when hiring, screening candidates more thoroughly to ensure they have the requisite skills and are culturally the right fit for a position. Likewise, candidates are likely to adopt a cautious approach to job searching, favouring jobs that offer long-term stability and career advancement. In 2017, relatively flat hiring can be expected in finance and accounting functions in the middle management level. 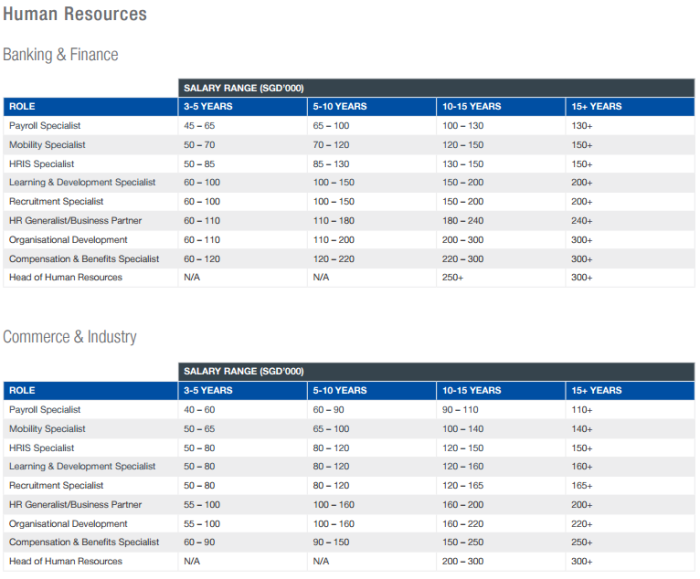 Nevertheless, opportunities are present for senior-strategic hiring and at the more junior levels (for operational finance roles). With the market expected to see limited growth, contracting will be a popular talent solution as more high-quality candidates are warming to the idea of working on a contract basis. Candidates who change jobs in this sector can expect to receive between 8% and 10% in increments, with contract workers usually commanding between 5% and 7%. The financial services and corporate governance sectors are expected to face some challenges in 2017. Most banks are consolidating and funds are performing below expectations. Insurance and commodities firms, as well as private equity and asset management, are expected to maintain status quo, with only some pursuing growth. Despite the current market outlook, permanent employees who change jobs can still expect between 8% and 10% in increments, while those who are unemployed before starting a new role may receive pay that is on par with their previous salary. Contractors who switch jobs can expect between 8 and 12% in increments. The high growth industries within the healthcare and life sciences function for 2017 are likely to be biotech, pharmaceutical and diagnostics. In general, candidates moving between jobs may expect salary increases of 8 to 12%. However, with more candidates starting to factor in overall benefits before deciding on a role, companies have started adopting flexible work hours and relooking their wellness policies in order to attract and retain staff. In the technology function, there will be a rise in demand for professionals with DevOps/data science/Internet of Things experience, fueled by the growth within the local e-commerce industry. Within e-commerce, the financial technology (fintech) sector is also set for growth, buoyed by significant government support. Increasingly, job seekers are now more receptive to joining Singaporean firms as they provide a stable work environment, and start-ups for technical growth and exposure. Local companies that provide training and development opportunities are also seen as more attractive. In the market, candidates moving between roles expect to receive between 10 and 15% increments, but they might be willing to settle for less when there are opportunities for continued learning and progression. At the junior levels, candidates can expect between 8 and 12% in increments when they change jobs. This article was originally published by Human Resource Online. The article expressed here are the authors’ from Human Resource Online. Learn more about Payboy payroll software and HR management tools that matter to your business.